Orange County, CA – The cost of food, equipment, and overhead is enough to cripple many food establishments unless precautions are taken. Restaurant managers should prioritize the lowering of energy costs if the business hopes to remain solvent long into the future. Here are the steps to follow when you want to minimize your energy bills to maximize the success of your commercial kitchen. Operational Changes: Keep track of business day-to-day and look for any lulls where you can turn off equipment, such as keeping one oven operational as opposed to all three, for example. The smallest actions can lead to major savings when it comes time to receive the energy bill. Low-Cost Retrofits: Vent hood professionals can examine your ventilation system to determine if any parts can be retrofitted for major savings. Going off-brand or refurbished can produce the same efficiency as a brand-new name-brand but get a professional’s opinion before any parts are switched out. This isn’t something you want to “wing,” after all. HVAC Maintenance: Your HVAC (Heating, Ventilation, and Air Conditioning) system accounts for nearly 30% of your overall energy expenses. For that reason, you will want to ensure that all of your system’s components are operating as they should. Regular ventilation cleaning and maintenance can keep your energy costs down and the risk of fire at bay. Short Pre-Heats: Many kitchen managers feel that it’s better to pre-heat early, but this can lead to exorbitant natural gas expenditures. Steam tables, grills, and broilers shouldn’t need to be pre-heated much or at all, and ovens should only need 15 minutes tops, depending on the appliance make, model, and age. Newer Equipment: While the thought of purchasing all new equipment can fill frugal restaurant managers with dread, those appliances will soon pay for themselves. When you consider that most major commercial food equipment is designed to be Energy Star rated, you can save loads by giving those energy-hog components the old heave-ho. The ventilation and commercial kitchen professionals can help you choose the ideal components for the lowest energy fees possible. Precook Foods: Potatoes, chicken, for example, can be cooked in a steamer before they are fried. Steamers are more efficient than fryers, and soon you’ll see the difference on your electric bill. 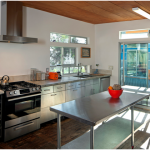 Proper Kitchen Layout: Believe it or not, the way you arrange your kitchen can lead to more significant energy costs. If your ovens are places directly next to your refrigerators, your fridges may have to work twice as hard. For best results and lower energy fees, place all your cooking equipment under a single vent hood and away from all cooling equipment. There is one more point that must be made. A clean kitchen in a more efficient and cheaper kitchen. When you consider that grease buildup and grime can jam up your vent hood fans and other ventilation system components, you could be paying more than you should to keep your kitchen operational. Regular cleaning by the ventilation and commercial kitchen system experts can keep your energy costs as low as you need to ensure your commercial kitchen – and overall business – succeeds. To learn more about reducing energy costs for commercial kitchens, contact Aps-Hoods, the commercial kitchen and food truck expert in Orange County, CA and Denver, CO. Get a free quote today!